Cincinnati was feeling it Monday night, so they get the win for Raw. This category is getting harder and harder for me since the two teams seemingly mold together being nearly the exact same, but I only have one thing to say.. Shut up Saxton. Whew, what a busy week for matches on both shows. Raw featured seven matches, and I enjoyed most of them actually. The B-Team are still champs and can stay champs forever since they're so entertaining. Sasha and Bayley... Whatever. Two more matches I don't care about in Mickie and Natty and then Mojo and Breeze. I liked the singles turned tag match with Rollins & Balor beating Ziggler and McIntyre. I love watching Ember Moon do her thing, so her match against Liv Morgan was welcomed. And then Roman beat Lashley to face Lesnar for the 900th time. DO. SOMETHING. NEW. Andrade Almas beat Rusev.. Bye bye Rusev push.. But I like Almas so I'll take it. Joe beat R-Truth, who everyone thought retired or something. Asuka defeated the dangerous Billie Kay. Some good stuff though.. Becky Lynch won a title shot by beating the champ, and The New Day took down SAnity. SD Live's lineup may not have been as star studded, but they did it in a way more entertaining way from top to bottom. Raw made history announcing the all women PPV, "Evolution". Any time Vince is on TV now, I love it. He commands respect no matter where he is, and oozes power. Corbin and Balor continue to go back and forth with pranks as Corbin put his stuff in a kiddy playhouse, Strowman beat the crap out of Singh while Jinder ran, and Steph undermined Kurt giving KO a shot at the MITB briefcase. I really enjoy Orton's angle about taking people out that the crowd put on a pedestal. He has nothing left to prove in his career, so why not just take out the people's favorite? If he is heading towards his last go for awhile, let it be as a heel. Then when he comes back as a face or turns face, the people will love it. I LOVED The Miz and DB promo. Throwing the baby, the two fighting, man I love these two together. They single-handedly get the SD the win here. I loved it. Sasha and Bayley need to be on separate shows, because if they aren't then they'll never get away from this. I love KO getting a shot at the briefcase. Why not? The B-Team need the belts, deserve the belts, and better keep the friggin' belts. I would love a fatal fourway between Ziggler, Rollins, McIntyre, and Balor for the IC Belt. Lashley should have won. There was no reason not to give us Lashley vs. Lesnar at this point. 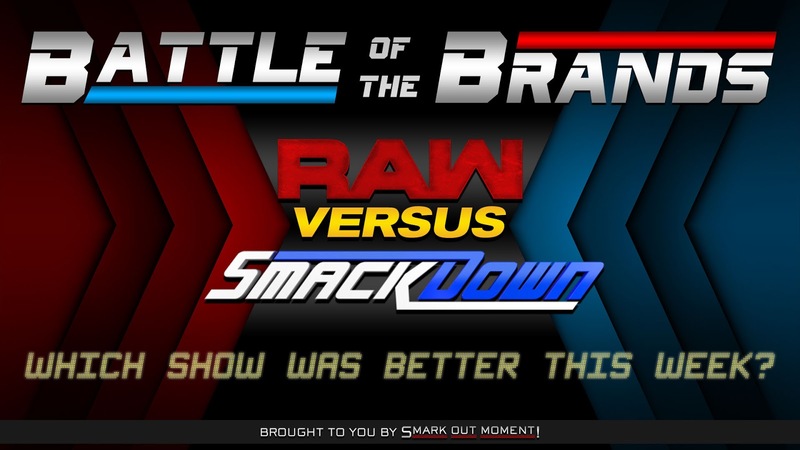 It would've felt like a big match, and it was the better alternative than Reigns for the 900th time. They made a mistake, let's hope they can fix it. Joe & Styles is the perfect match for the WWE Championship. I, along with several others I'm sure, thought Joe would have had a title run by now, but the cards haven't fallen that way. I think his time is now, however. Let Orton loose! Let him be the dastardly 2010's heel. Becky Lynch & Asuka are the best women wrestlers on the roster (Charlotte as well, obviously), so I'm hoping Becky's win sets up a match between the two down the line. The Miz vs. Bryan has been a year in the making, and it is going to hit our expectations and then some. Great heel, great baby face, great storyline. Magic. You all know exactly how I feel here. This week was a highlight in this category for SD Live. They started and ended with the right segments, and the matches were exactly what they needed to be. MIZ THREW A BABY (doll). SmackDown ran away with it this week at a 6-1 pace. The Miz and Daniel Bryan are a big part of that, and their promo was just gold to me. I truly enjoyed it. Both are great at their roles, and this is going to be so much fun. SmackDown's roster may not be as loaded, but they're definitely the more entertaining crew right now.